Century Cycles Blog: Introducing - The Pet Trike! 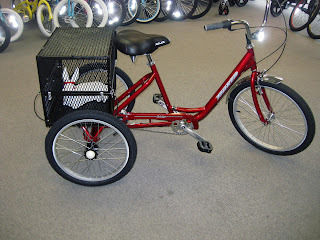 Are you cruising around on your tricycle but in need of a way to take your pet with you? Here is a modified Torker Tricycle 3-speed ($609.99), now known as the "Dogcycle." The carrier design is by our customer Lois Sanford, and her "double size dog basket" was put together by Medina store Service Manager Don Barnett. The trike has a cargo deck from Sun bicycles ($22.99) and an additional cargo basket ($56.99) from Torker that is inverted and hinged on with some creative hardware. It is now ready for your doggie or favorite pet. Shown here in Candy Red with Medina's own mascot The Killer Rabbit of Caerbannog (also known as Concrete Bunny), the tricycle is ready for hitting the town or leisurely pedaling through the countryside. Notice how comfortable CB is in the pet carrier section! With a dog bed added this is certain to be the trike of choice for the discriminating dog-lover. Order yours today!